If you lived here you’d be in astronomy paradise. This is the summer Milky Way and galactic centre in Sagittarius and Scorpius rising before dawn early this morning. The setting is the Painted Pony Resort in New Mexico, and its adobe lodges. There’s no more spectacular sight than this in the night sky, other than perhaps an all-sky aurora display. And they don’t get too many of those down here at 31° North in southern New Mexico. This image is a stack of ten 3-minute exposures for the sky (to smooth out noise) but the ground is from just 2 of those exposures and is blurred because the camera was tracking the sky. Light from walkway lights, plus starlight itself, added just enough illumination to provide details in the foreground. So to be clear – this is a real scene. 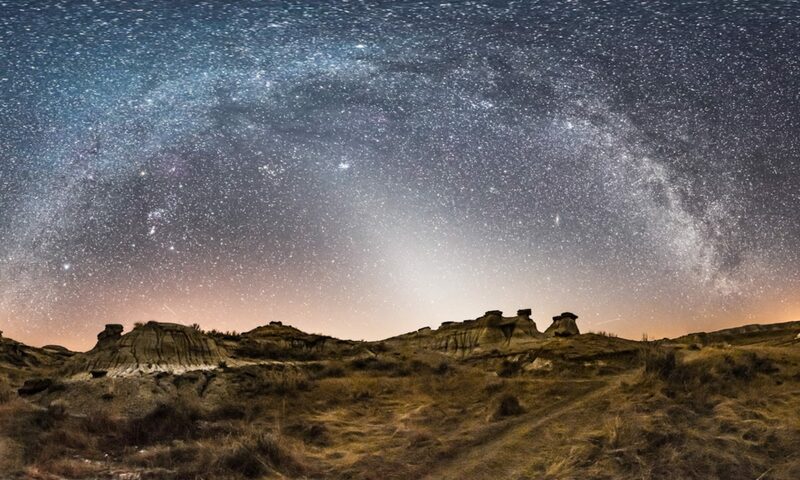 The Milky Way has not been pasted onto a separate image of the foreground. However, colour and contrast have been boosted to bring out details your eye would not have seen had you been standing here early this morning in the frosty New Mexico night. Again, as with my previous image taken earlier in the night, I used the new Samyang 14mm ultra-wide angle lens, at f/2.8. It works very well! 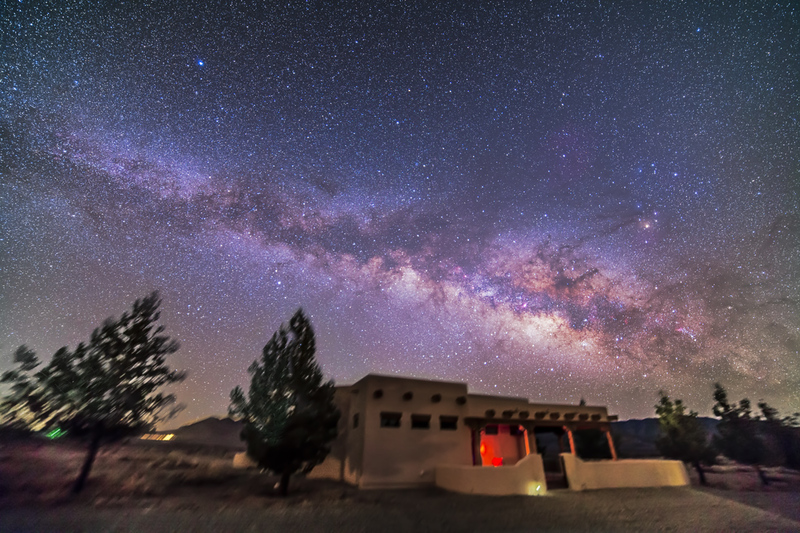 In the land of enchantment, the winter Milky Way sets over our adobe house. I’m in New Mexico, enjoying wonderfully clear skies. 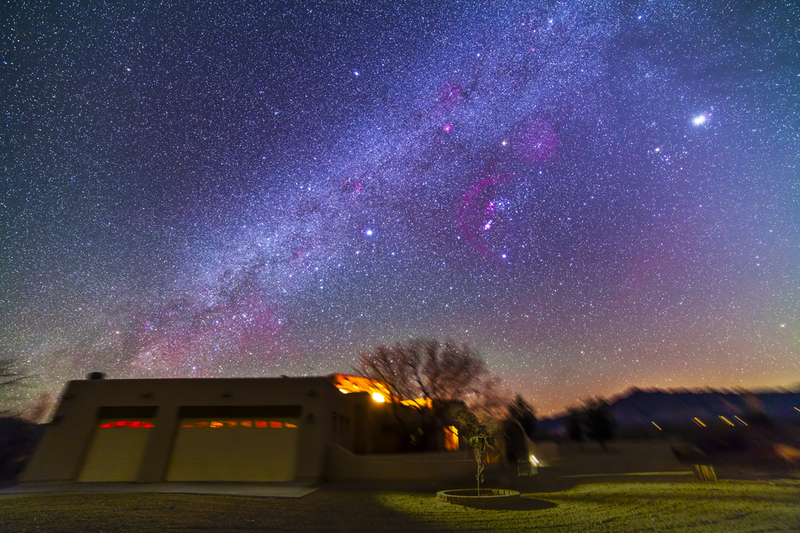 In the early evening the winter Milky Way runs north and south then turns to set over in the west, as it’s doing here, over the main house at the Painted Pony Resort near Rodeo, in southwest New Mexico. Jupiter and the stars of Taurus are at upper right, and Orion is just right of centre. Above the house shine Sirius and the stars of Canis Major and Puppis. The area of red in the Milky Way just above the house is the massive Gum Nebula in Vela, an area of sky hidden from us in Canada. For this image I combined a stack of five 5-minute tracked exposures taken with the Canon 5D MkII at ISO 800 and 14mm Samyang lens wide open at f/2.8. The ground details are from two of the exposures. This was a fabulous night with more to come this week.